A-HOTEL.com - Luksus og billig hoteller i Jefferson, USA. Overnatting booking i Jefferson og omkringliggende. Located 3 minutes’ walk from USC campus this hotel offers easy access to campus events. It features an outdoor pool and hot tub and rooms with free WiFi. Situated 4 minutes’ drive from the University of Southern California, this Central Los Angeles motel offers an outdoor pool. University Village and the Children's Museum of Los Angeles are less than 1 mile away. Set 2.4 km from Microsoft Theater, Downtown Lofty Residences is located in South Los Angeles district of Los Angeles. Located in the South Los Angeles district in Los Angeles, Park Motel is 700 metres from the Los Angeles Memorial Coliseum. Free private parking and free WiFi are provided. Located 2 miles from the University of Southern California, this Los Angeles motel offers simply furnished rooms with free Wi-Fi. Vending machines featuring drinks are located on-site. Dette motellet ligger sentralt i Los Angeles og har rom med sittehjørne og gratis Wi-Fi. Staples Center ligger 6,5 km unna. Located 2.6 km from Microsoft Theater, The Victorian Guest Suite 9. Situated in the South Los Angeles district of Los Angeles, Los Angeles RoomRentals near USC features rooms with free WiFi. This property is located a short distance from attractions such as Natural History Museum of Los Angeles County. Featuring air-conditioned accommodation with a patio, The Victorian 3 Bedroom Apartment 2.4 is located in Los Angeles. Set 2.7 km from L.
Solo Motel Broadway is offering accommodation in Los Angeles. 2. Staples Center Two Bedroom Luxury Suite offers accommodation in Los Angeles, 1.1 km from Microsoft Theater and 1. Situated in the Downtown Los Angeles of Los Angeles, Luxury Apartments Downtown LA provides accommodation with free WiFi, a spa centre and a hot tub. The apartment provides guests with a balcony, city views, a seating area, a flat-screen TV, a fully equipped kitchen with a dishwasher, and a private bathroom with bath. Just 1.2 km from Microsoft Theater and 1. Located right in the centre of Los Angeles, Downtown LA Convention Center Apartment features air-conditioned accommodation with free WiFi and a flat-screen TV. The apartment is 1. 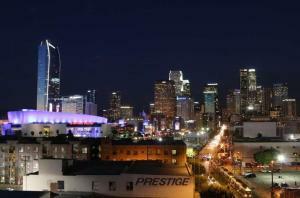 1.2 km from Microsoft Theater, DTLA Designer Apartment is located in the Downtown Los Angeles district of Los Angeles. Situated 600 metres from Staples Center and 600 metres from Microsoft Theater, Downtown LA Convention Center Suite provides accommodation set in Los Angeles. With city views, this accommodation offers a balcony. Located in the Downtown Los Angeles of Los Angeles, 800 metres from Microsoft Theater and 800 metres from Staples Center, DTLA Convention Center Stylish Apartment offers free WiFi and air conditioning. This apartment provides accommodation with a balcony. Urban DTLA Two Level Staples Center Loft enjoys a location in Los Angeles, just less than 1 km from Microsoft Theater and an 11-minute walk from Staples Center. The property is 1. Located in Los Angeles, less than 1 km from Microsoft Theater and an 11-minute walk from Staples Center, Urban Dtla Two Level Fashion Loft offers a terrace and air conditioning. Free WiFi is available.